Create finite impulse response (FIR) filters and complete mixed FIR + IIR filter loudspeaker presets for single and multi-way loudspeakers. Load filters into any FIR capable speaker processor or amplifier. Advanced Direct-to-Processor function available for some brands. 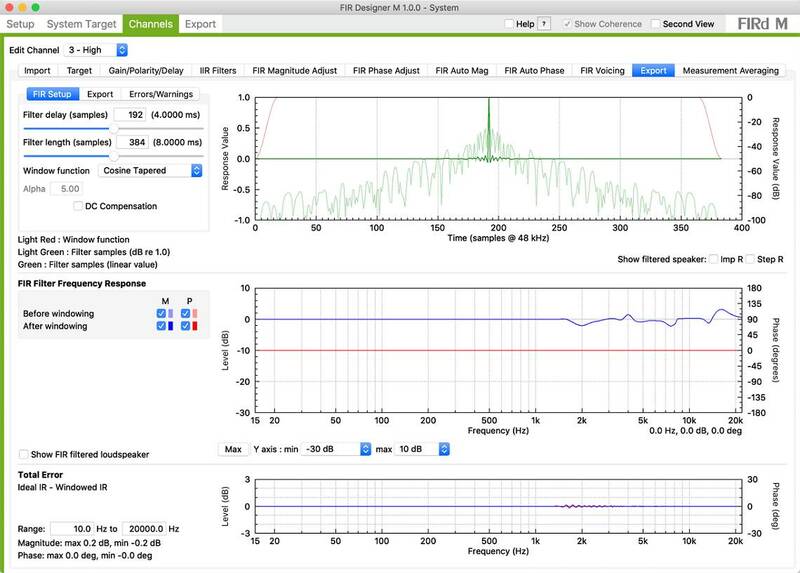 Simulate the combined multi-way frequency response and time/frequency (wavelet) behaviour. Create loudspeaker tunings/presets with specific magnitude and phase characteristics. Match different makes & models of loudspeakers in install systems. To LAKE PLM & D series amplifiers. Requires the FIR Designer LAKE plugin and the LAKE FIR 3-way module. To Powersoft X, Ottocanali, Quattrocanali and DueCanali series amplifiers. Works via an XML file which can be loaded into the amplifier’s “Speaker EQ” or “Output EQ”. Can optionally side-load pre-existing FIR filters (with sample-rate-conversion, if necessary) from other programs for transfer to LAKE &/or Powersoft (subject to their FIR tap limits). Moveable license: deactivate and reactivate on a new computer. Compare FIR Designer & FIR Creator features on our Filter Software Comparison Table.